When we first began discussing making a film about antibiotics resistance, we were clear on one thing: we wanted it to be fictional. Of course, as science graduates (now makers of science TV) who met on Imperial College’s Science Media Production masters course, it was important that the science was right. But the story for this as-yet-unfilmed film had to be made up. We wanted to make a film about this real and important scientific issue, but have it connect with people on a new, more emotional level. It seems that almost every week we see another news story about the threat of AMR, but the public aren’t engaging with the meaningful steps necessary to tackle this growing problem. With a fictional film, in which we could heighten the dramatic tension and jeopardy, we hoped to get away from reports and headlines, and start to tug on the heartstrings. 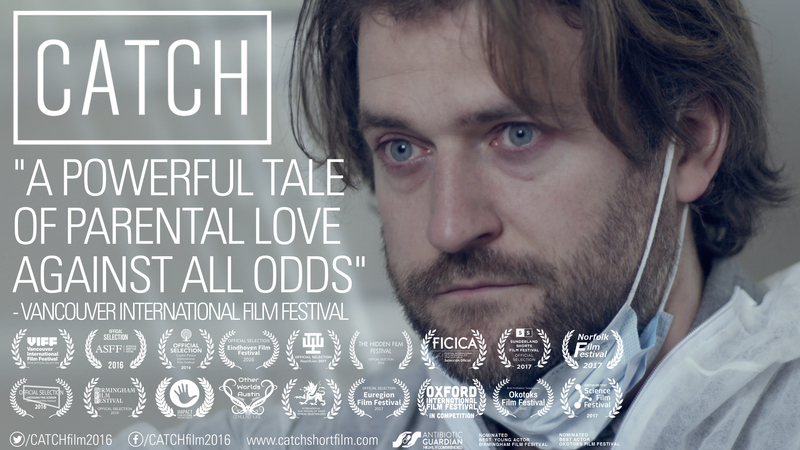 The film that we eventually wrote and directed, with the backing of a crowdfunding campaign and the support of the Royal College of Pathologists for the wider project and website, is called CATCH; a short drama film about a father and daughter quarantined in their home in a post-antibiotic near future. Our dual aim was to portray a fictional worst-case scenario being experienced by real, relatable characters – and root that narrative in the science of antibiotic resistance. We consulted several leaders in the field – Prof Tim McHugh from University College London (UK), Prof Laura Piddock from The University of Birmingham (UK), Prof Ruth McNerney of The University of Cape Town (South Africa), and Dr Nick Brown from Addenbrooke’s Hospital (UK)- to inform our writing and to act as advisors and interview subjects for the online public outreach side of the project. In the last year, CATCH has screened at 18 festivals on five continents including the BAFTA-accredited Aesthetica Short Film Festival, Vancouver International Film Festival, and Rapidlion International Film Festival in Johannesburg. The film has been written about in the Lancet and the Longitude Prize Blog, and was highly commended at the Antibiotic Guardian Awards in 2017. Do watch and share CATCH, as we collectively try to raise awareness of, and catalyse tangible action on, this global health crisis.